Get explanations for the rating icons that appear on-screen at the beginning of a program. Exempt programming includes: News, sports, documentaries and other information programming; talk shows, music videos, and variety programming. Programming intended for children with this designation must adhere to the provisions of the Children’s section of the Canadian Association of Broadcasters CAB Violence Code. As this programming is intended for younger children under the age of 8 years, it will pay careful attention to themes which could threaten their sense of security and well-being. As programming for children requires particular caution in the depiction of violence, there will be no realistic scenes of violence. Depictions of aggressive behavior will be infrequent and limited to portrayals that are clearly imaginary and unrealistic in nature. This classification is applied to children’s programming that is generally considered acceptable for youngsters 8 years and over to view on their own. It is suggested that a parent/guardian co-view programming assigned this classification with younger children under the age of 8. Programming with this designation adheres to the provisions of the Children’s Section of CAB Violence Code. These include not portraying violence as the preferred, acceptable, or only way to resolve conflict; or encouraging children to imitate dangerous acts which they may see on the screen. Programming within this classification might deal with themes which could be unsuitable for younger children. References to any such controversial themes shall be discreet and sensitive to the 8-12 year age range of this viewing group. Any realistic depictions will be infrequent, discreet, of low intensity, and shall portray the consequences of violence. Violence portrayed must be within the context of the storyline or character development. Might include mild physical violence, comedic violence, comic horror, special effects; fantasy, supernatural, or animated violence. Language: No profanity; might have infrequent use of language which may be considered by some to be socially offensive or discriminatory, and then only if employed within the context of storyline or character development. Considered acceptable for all age groups. Appropriate viewing for the entire family. This is programming intended for a broad, general audience. While not designed specifically for children, it is understood that younger viewers may be part of the audience. Therefore programming within this classification shall contain very little violence, either physical, verbal or emotional. It will be sensitive to themes which could threaten a younger child’s sense of security, and will depict no realistic scenes of violence which minimize or gloss over the effects of violent acts. This programming, while intended for a general audience, may not be suitable for younger children (under the age of 8). Parents/guardians should be aware that there might be content elements which some could consider inappropriate for unsupervised viewing by children in the 8-13 age range. Programming within this classification might address controversial themes or issues. Cognizant that pre-teens and early teens could be part of this viewing group, particular care must be taken not to encourage imitational behavior, and consequences of violent actions shall not be minimized. Any depiction of conflict and/or aggression will be limited and moderate; it might include physical, fantasy, or supernatural violence. Any such depictions should not be pervasive, and must be justified within the context of theme, storyline or character development. Programming with this classification contains themes or content elements which might not be suitable for viewers under the age of 14. Parents are strongly cautioned to exercise discretion in permitting viewing by pre-teens and early teens without parent/guardian supervision, as programming with this classification could deal with mature themes and societal issues in a realistic fashion. Might contain intense scenes of violence. Intended for viewers 18 years and older. This classification applies to programming which could contain any or all of the following content elements which would make the program unsuitable for viewers under the age of 18. How Do I Cancel Override? Within the Parental menu, arrow to the right and select the Cancel Override category. The Cancel Override category allows any previous PIN overrides for an extended period of time to be cancelled. To cancel an existing override, select OK within the Cancel Override prompt. Once the override has been cancelled, the parental PIN will need to be used for all Locked and Rated channels. Within the Parental menu, arrow to the right and select the Change PIN category (For the Ratings PIN or Purchase PIN). Use the arrow button to highlight change PIN and press the OK button. Enter the Old PIN, arrow down and enter your New PIN, and then arrow down to confirm the New PIN. Select OK to save your new PIN. Until you change it, the default PIN is 0000. Once the PIN has been successfully changed, a prompt will appear. Press the OK button. How Do I Control Access Based On Ratings? Within the Parental menu, arrow to the right and select the Set Ratings category. The Set Ratings category allows you to set access to programming based on TV and Movie ratings. This will require that a PIN be entered in order to view programming at or beyond the rating you specify. How Do I Control Channel Access? Within the Parental Menu, arrow to the right and select the Edit Locked category. The Edit Locked category allows you to lock specific channels. This will require you to enter a PIN in order to view programming on that channel. A list of channels will display. Use the Up/Down arrow buttons to move through the list of channels. When you arrive at one that you want to lock, press the OK button and the channel will be added to the locked list. When you are finished making your selections, press the Blue button on the remote to lock the selected channels. Press the Red button on the remote to discard the changes and return to normal viewing. How Do I Set Time Restrictions? Within the Parental menu, arrow to the right and select the Time Restrictions category. The Time Restrictions category allows you to set time periods per day where television access requires a PIN. These time restrictions may be set by selecting the Green button to Add Restriction. A new restriction will appear to the right of the week schedule. Arrow to the right to select a day and press the OK button. Once a day has been selected, use the Up/Down arrows to select a time and either AM or PM for both start and end time for the time restriction. When you are done creating time restrictions, select the EXIT button. Within the Parental menu, arrow to the right and select the Options category. The Options category requires the Ratings PIN to be entered in order to update any settings. Enter your PIN and select OK and press the OK button. Once the Ratings PIN has been entered, you may choose to have Locked Channels and/or Show Restricted Titles visible. Selecting a “No” value for either setting will cause these programs to not appear in the Guide. Select OK within the prompt and press the OK button. To access the VOD menu, select the ON DEMAND button on your remote control. The Movies/Video On Demand feature provided by the service allows you to choose from a listing of popular movies/events within the Movies Library. Once chosen, these purchased movies will be added to your Rental library and will be available for viewing for the allocated amount of time. In order to purchase a new event, select the VIDEO ON DEMAND button on your remote control. The Library Main Screen will appear. Select the library that you would like to choose from including: Free On Demand, HD, Movies, New Releases, Ending Soon, or Most Popular. Once in the desired library, select the event that you would like to purchase. The library description for the selected event will appear. The movie title, price, rental period, event description, rating, and event length will be shown. In order to preview a trailer for the event, select the Preview button. In order to purchase the event, select the Rent button. A Purchase Information Screen will appear containing the event's title and price. The purchase screen will allow you to share the event with the rest of your whole home group before asking for your Purchase Pin. Enter your Purchase Pin and select the Rent button. Your purchased event should begin playing immediately. Press the EXIT button on your remote control to return to your previously viewed channel. To view your current Video On Demand rentals that are available for viewing, select the VIDEO ON DEMAND button. Select the GREEN button on your remote. The Rentals screen will appear and will show all of your current event rentals, the price of the events, whole home sharing availability for each event, and the date each rental will expire. To watch the selected event, press the OK button on your remote control. To search for a specific Video On Demand title, select the YELLOW button on your remote. A Search Library screen will appear. Enter a keyword or title into the search field and select the YELLOW button again. Search results for the entered title/keyword will appear. How Do I Set Up My VOD Purchase PIN? The VOD Purchase PIN and the Parental Control Ratings PIN are the same. Until you change it, the PIN is 0000. Select the MENU button on your remote control. Within the Parental menu, arrow to the right and select the Change PIN category (For the Ratings PIN or Purchase PIN). Enter the Old PIN, arrow down and enter your New PIN, and then arrow down to confirm the New PIN. Select OK to save your new PIN. Click on the drop down menu and select Wightman Telecom. After selecting Wightman Telecom as your provider, you will need to click on Register. If you have already registered, click Log In. After clicking Register, you will be taken to the Registration screen. You will have to fill in all the blanks. You will need your 8 Digit Account number which is found on your bill/statement. When all the blanks are filled in, click Register, at the bottom. *Please note the Verification Code is the number that appears after the word Enter. (Outlined in red in the picture). Once you have filled in the information and clicked the Register button, you will receive a notification that an email has been sent to the address provided. Open your email and click on the link within to complete the registration process. Once you have completed the registration process by clicking the link in your email, you will be taken to the login page. Here you will enter the email and the password that you created during registration. Note: You may want to add this site to your Bookmarks/Favourites, for easier access in the future. After Logging in you will see the channels that are available to you based on the TV packages you are subscribed to with Wightman. Please ensure there is a light on the front of the STB. Please Note: The colour of the light will vary depending on the STB you have. It will be either red, green, or blue. Check the cables on the back of the STB and the back of the TV to ensure they are secure. Check to see if the STB runs through any other hardware such as a DVD or VCR. If so, ensure this is turned on. Bypass any extra devices such as your DVD player or VCR and connect the STB directly to the TV. Remove the power cord from the back of the STB for 5 seconds. Please Note: The power cord is a thin black cable. The light on the STB will go off once the power is removed. Please ensure your TV is set to input that corresponds with the STB connection. Press the Input button on your remote control to change the TV input. Please note: If using the black Wightman remote, the Input button will be at the very bottom on the left hand side of the remote. Please note: If using the "big button" Wightman remote, the Input button will be to the right of the zero (0) at the bottom of the remote. If you are unable to change the input using your Wightman remote control please try using either your TV remote or the buttons on the TV. Please Note: The button on the TV remote my say Input, Source, or TV/Video. If your TV is still displaying a No Signal message and you are able to try another video connection please do so and adjust the setting on the TV accordingly. If there is still a "No Signal" message on your TV, please call our 24 hour Technical Support Team at 1.877.327.4440 to schedule a technician visit. Be on a fibre fed service. This includes Customers in MDU's that are fed by fibre and service is over in-building copper. What happens if you tune to a 4K channel or recording from a non 4K TV? If the output resolution for the Amulet 6 is set to match the non 4K resolution of the TV (i.e. 1080P), the 4K channel will be scaled down to the current resolution of the TV. 3. What happens if you tune to 4K on a TV connected to a non 4K STB? The Set top box will display a black screen. Audio will still function. 4. What happens if the Amulet 6 is connected to the TV using Composite cables, and watching 4k? 5. What if I want 4K channels and have your fibre service, a 4K TV and subscribe to SN. Great, to enable 4K, you need an Entone Amulet 6 DVR Set Top Box. There is a self install upgrade charge of $75 for the new device or if you want us to come out and install it, the total charge is $100. The 4K STB is $16.95 per month rental. 6. I have all the above and I have an Amulet 6 DVR STB. Are there any incremental charges? You are good to go and there are no incremental charges. 7. Is all content on the 4K channels filmed in 4K? Not necessarily. On the SportsNet channels, Rogers does not record or broadcast all of the NHL and NBA games in 4K. They typically publish a list of the games in 4K. Even if a game is not recorded in 4K but is scheduled on the channel guide, it will play. See the NBA and NHL 4K schedules above for examples. 8. How can we see what games are broadcast in 4K? Sportsnet provides a view of 4K games on their website. The screenshot below shows how they indicate if it is a 4K broadcast. This is available at: Is all content on the 4K channels filmed in 4K? Q: How can we see what games are broadcast in 4K? My Screen is blank, or display "No Signal" or a similar Message. Press the INPUT button on your remote. Press INPUT repeatedly until the desired source is selected. If it seems you're missing certain channels, or if you're unable to find a specific channel in the guide, you may have the channel filter set to showing a specific type of channels i.e. Showing only Sports Channels. Ensure the guide is set to All Channels or Subscribed Channels by pressing the FAV button while in the Guide. If you are wanting to ensure it is always staying on *All Channels* then you will want to ensure the 'Remember Channel Filter' is set to No. Go to Menu -> Settings -> Guide. Once you are in the guide settings, you will locate where the 'Remember Channel Filter' is and ensure it is set to No. At this point you should have all your channels showing up in the guide, if you are still missing channels then you will need to call Technical Support at 877-327-4440 as we are available 24/7. When did it last work? Have you made any changes to your television setup since then? Do any buttons work, like the channel up and down buttons, or the volume up and down buttons? When you press a button on the remote, does the STB button light up? The STB button does light up when I press a button, but nothing happens. Make sure there is a clear line-of-sight between the remote and set-top box. Replace the batteries in the remote, as they may be weak. You may need to program the remote for the set-top box again. Follow the steps here to program your remote control to your set-top box. If the remote is still not responding, please call 1.877.327.4440 to arrange a swap of your remote. The STB button does not light up, and nothing happens. Replace the batteries in the remote, and verify they are installed correctly. STB does not light up, but the TV button does, and I can still change the volume and control power for the television. Press the STB button on the remote, then try Guide, channel up and down, and volume up and down. Make sure there is a clear line of sight between the remote and set-top box. Replace the batteries in the remote, they may be weak. The STB button lights up and I can change channels using Channel Up and Down or by entering the number, but I can't bring up the Guide or Menu. Press the STB button, then try Guide and Menu again. Make sure there is a clear line-of-sight between the remote and the set-top box. Cable it up the way it was previously and go to Menu, then Settings, then Display, then change Connector Type to the desired output, then press Save. The menu will now disappear, and you can change the cabling in use to the desired standard. Call 1.877.327.4440 for assistance, as we can change the display type remotely. My remote has no STB button, just TV and CBL buttons. Please call 1.877.327.4440 to arrange a swap of your remote.We no longer support the silver coloured “Polaris” remote control. My remote is the Big Button Remote. To find your type of remote, click here. Press the STB button. This may turn the television off. Press the STB button again to turn it back on. Now try pressing Guide and Menu. If the remote is still not responding, please call 1.877.327.4440 for assistance. If you like to be able to surf within only a specific set of channels, you can create Favourites lists. By default, your set top box has grouped channels into several pre-set Favourites lists including: All Channels, Subscribed Channels, Movie Channels, Sports Channels, Music Channels, Entertainment Channels, Kids Channels, News Channels, Business News Channels, Infotainment Channels, Religious Channels, Regional Channels and HD Channels. You may create up to five additional Favourites lists. Press the MENU button to access the Main Menu. Highlight TV. Use the arrow buttons to highlight Edit Favourites and then press the OK button. If you are not already in a ‘New List’ by default, arrow right to access a New List. All available channels will display. Use the Up/Down arrow buttons on the remote control to move through the list of channels. When you are on a channel you want to add to your list, press the OK button to mark it as part of this Favourites list. To name the list, press the Yellow button on the remote control. Use the arrow buttons to move through the letters on the screen. Press the OK button on the remote control to choose a letter. When you have named your list, arrow down to select the Submit to accept your name. To Save your favourites list, press the Blue button on the remote control and then press the OK button. To Discard a favourites list, press the Red button on the remote control. Press the EXIT button on the remote control to leave the menu. To view the available Actions associated with each Favourites List, press the Green button on the remote control. The Actions list displays on the right side of the screen. To make it easy for you, the list of Actions on the screen shows the corresponding button that you could press on the remote control. You can also highlight your selection and then press the OK button on the remote control. 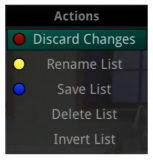 Selecting the Discard Changes option will exit Edit Favourites without making any changes. Rename List allows you to change the name of this list without changing the channels that were previously selected for this list. Save List will save any changes made to this Favourites List. Delete List will delete this list from your Favourites. Invert List lets you select or deselect channels in this Favourites List. For example, if you have selected 10 channels in this Favourites List and click OK on Invert List, those 10 channels will be deselected and all of your other subscribed channels will be selected. If you click OK again those 10 previously selected channels will be back in the list while the rest of the subscribed channels will be removed. Press the FAV button on the remote control. All Favourites lists will display. Lists that you have created will display with a star. Arrow down to highlight the Favourites list you want to use and then press the OK button on the remote control. The list you have selected will show just above the channel number. With the favourites list selected, you will browse channels only within that list. Press the LIST button one time to access the list of Recording Folders. The All Recordings folder appears first and includes all of the recordings you have stored on your DVR. If grouping is enabled in your setting, each program will also have a folder including all recordings of that program. To move in and out of the folders, use the Left/Right arrow buttons. At the top of the screen you see the number of folders and the amount of space you have free on the DVR. Delete a recording by pressing the Red button on the remote control. View the available Actions by pressing the Green button on the remote control. Actions include Play Recording, Edit Item, Information, Go Back, Move to Folder, Protect, Sort List, Close Actions and Delete Recording. Search for programs within the Recording folders by pressing the Yellow button on the remote. Sort the Current Recordings by pressing the Blue button on the remote control. By default, Current Recordings are displayed by date and time. If you press the Blue button, programs will be sorted by Name. Press the Skip Forward button to view recordings by title rather than group. To view the available Actions, press the Green button on the remote control. The Actions list displays on the right hand side of the screen. To make it easy for you, the list of Actions on the screen shows the corresponding button that you could press on the remote control. It is also possible to highlight your selection and then press OK on the remote control. Select Play Recording to start the currently selected recording. To extend the end recording time on a recording in progress, select Edit Item. To show or hide Information about the recording, press the INFO button. This expands or hides the view of information. Simply highlighting a recording and pausing for a brief moment will also display the information. To Go Back to the previous screen showing All Recording Folders, press LIST. To move the recording to a specific folder arrow to select Move To Folder. To group the recordings by their titles, select the Skip Forward button. To Protect a recording so that it does not automatically get deleted, use the arrow buttons to highlight the protect option and then press the OK button. When you do, a shield symbol will display next to the program name letting you know that this program is protected. If you want to remove protection from the recording, simply choose Protect again. To Sort the List of Current Recordings, press the Blue button on the remote control. At the bottom of the screen you will see the sort change to being sorted by Name. Press the Blue button again to change the sort back to date and time. To Close the Actions, either press the Green button or press the EXIT button on the remote control. To Delete the Recording, press the Red button on the remote control. Select Yes or No to delete and then press the OK button. Press the LIST button a second time to view your list of Future Recordings. These are programming events that are waiting to happen. At the top of the screen you see the number of recordings and the amount of space you have free on the DVR. Delete a future recording by pressing the Red button on the remote control. View the available Actions by pressing the Green button on the remote control. Actions include Edit Item, Information, Go Back, Move to Folder, Sort List, Close Actions, and Delete Recording. To view the available Actions, press the Green button on the remote control. The Actions list displays on the right side of the screen. To make it easy for you, the list of Actions on the screen shows the corresponding button that you could press on the remote control. You can also highlight your selection and then press the OK button on the remote control. To Edit the Item, press the OK button on the remote control. You can change the time that you Start Recording and Stop Recording. This allows you to begin and/or end recording to allow for time padding around the program. To Go Back to the Future Recordings Folder List press the LIST button. To Sort the List of Future Recordings, press the Blue button on the remote control. At the bottom of the screen you will see the sort change to being sorted by Name. Press the Blue button again to change the sort back to date and time. Press the LIST button a third time to view your Series Recording Rules. These are the programs that you have set to record on a regular basis. You can make adjustments to your series recording rules from this screen. At the top of the screen you see the number of Series Rules and the amount of space you have free on the DVR. Delete a rule by pressing the Red button on the remote control. View the available Actions by pressing the Green button on the remote control. Actions include Edit Item, Information, Increase Priority, Decrease Priority, Sort List, Close Actions and Delete Rule. Search for programs in the recordings folders by pressing the Yellow button on the remote. Sort the Series Rules by pressing the Blue button on the remote control. By default, Series Rules are displayed by Priority. If you press the Blue button, programs will be sorted by Name. Choose how many episodes to Keep at Most any given time. Options are 1 – 10 or All episodes. Use the arrow buttons to make your selection. Choose the Show Type that you wish to record. You may choose to record all episodes of a program or just new episodes. Choose when to Start Recording. You can begin ‘on time’ when the program is scheduled to begin. Or you can use the arrow buttons to choose 1, 2, 3, 4, 5,10, or 15 minutes early. Choose when to Stop Recording. You can stop ‘on time’ when the program is scheduled to end. Or you can use the arrow buttons to choose 1, 2, 3, 4, 5,10, 15, 30, 45, or 60 minutes late. Finally choose the Folder where you want to save the recording and whether you’d like your television to auto tune to the channel. Arrow to highlight Update Series Recording and press the OK button on the remote control to save your changes. To Cancel your changes, highlight Exit and press the OK button on the remote control. The priority of programs is represented by their order in the list. The top program on the list is the highest priority and the bottom one is the lowest priority. So, if you have several programs scheduled to record at once and the system is unable to provide resources to record all of them, the DVR will record based on highest priority. To change Priority, simply highlight the Action to Increase or Decrease Priority and then press the OK button to adjust priority. To Sort the List of Series Rules, press the Blue button on the remote control. By default Series Rules are sorted by their Priority. You can change them to sort by Name. Press the Blue button again to change the sort back to Priority. To Delete the Rule, press the Red button on the remote control. Select Yes or No to delete and then press the OK button. Scroll to Audio Language and use the right arrow button on your remote to selected Described Video. Then press OK.
Now, any program with Described Video available will play it along with the standard audio.